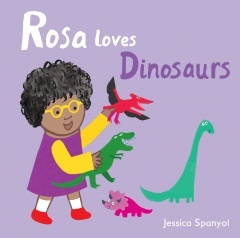 ROSA LOVES DINOSAURS featured in BOLD GIRLS reading Guide! We're thrilled that our upcoming title ROSA LOVES DINOSAURS by Jessica Spanyol has been included in the Children's Books Ireland BOLD GIRLS Reading Guide! Meet Rosa and her friends in May! To find out more and read the guide, click here! You are here: News » ROSA LOVES DINOSAURS featured in BOLD GIRLS reading Guide!